Lighten up. Our beliefs are more alike than they are apart. All it takes is waking up a bit to notice. The ancient Egyptians believed that at the end of your life your heart was placed on a scale and measured against the weight of a feather. If your heart was heavier than that feather, Osiris or Horis or Boris or whatever dude was in charge of the afterlife in that reality had you go back to school/Earth and learn your lessons again. Wash, rinse and repeat. The analogy holds today more than ever. So why not lighten up? If you have something to lose it’s no doubt just the 300 pound anchor around your neck. What’s another word for that 300 pound anchor holding you back? Karma. And you can stop carrying it anytime. In every philosophy, every great religion, everywhere, forgive and let live starts within yourself. It’s about the way you feel about your world and science is proving that your consciousness has a real affect on your reality. We’ve all played a game of cat and mouse with our egos long enough and it’s time to wake up and smell the shift. Ask yourself, what does consciousness mean to you? Yet we spend energy arguing over our differences instead of embracing our similarities. It becomes easy to fear, to miss the magic, the mystery, the light that is all around us. There’s a lot of mysteries out there and my hobby has been reviewing it all since I was a kid, no matter how implausible. It’s the stuff of great imagination. I’ve found enough of a mix of imagination, inspiration and reality here to make things interesting and I’d just enjoy seeing as many people as possible turning down the volume for a bit, opening to new ideas and imagining together with me. Afterall, imagination makes the world go round. There’s strength in numbers and differing points of view. Another words, your reality makes mine stronger, so let’s dance. If you’re worried about the world ending in 2012 because a bad movie told you so, don’t. Just don’t. As F.D.R. said, “The only thing we have to fear, is fear itself”. Sometimes people just talk too much and the truth gets lost. The Maya, the Hopi, many other aboriginal peoples did indeed have lots to say about the era we’re in, they tapped into the ethers to tell us about how we are living the end of the old, and facing a new and wonderful beginning the likes of which has never been seen. It’s not some far off legend, it’s right now. It begins and ends with this very moment. In reality, or at least what I can see of it, the only thing that matters is that we live in love instead of fear and that happens whether it’s 1912, 2012 or 2222. So often we spend all day talking and yet we don’t listen to each other. Somebody once said prayer is the act of talking to the Divine and meditation is listening to it. At one time or another it seems we all forget to listen, don’t we? I’ve never been the woo woo type. I grew up on a farm, moved to L.A. and work in the entertainment industry. For some hectic years I got so busy thinking I was being “entertaining” I forgot a sense of wonder I once had as a child, a wonder that all children have at the possibilities held in all that cannot be explained. Then a few years back I started my own journey to answer the questions I’d swept aside for too long and found that there was plenty of profoundness to be touched online, in various places of worship or even on the dusty shelves of out of the way bookstores but that it wasn’t all organized in one space in a way that was simply put and made good sense to me. The learning curve was long and it bent toward boredom if not outright exhaustion. That’s why I created Waking Universe, to assemble other people’s truths as well as my own under one roof and in a way that is hopefully not too boring. A place of meditation, conversation and speculation. A place where spirit and science meet and smoke the peace pipe, chill out and learn from each other. Whenever you see “Excerpts from Alexandria II” know that’s my own story and the making of the Waking Universe project. It’s a book and television series I’m working on. You’ll start to see television clips of the actual show up here soon. I’ll be reviewing some books too and I invite you to turn off your t.v. and dust one off instead. 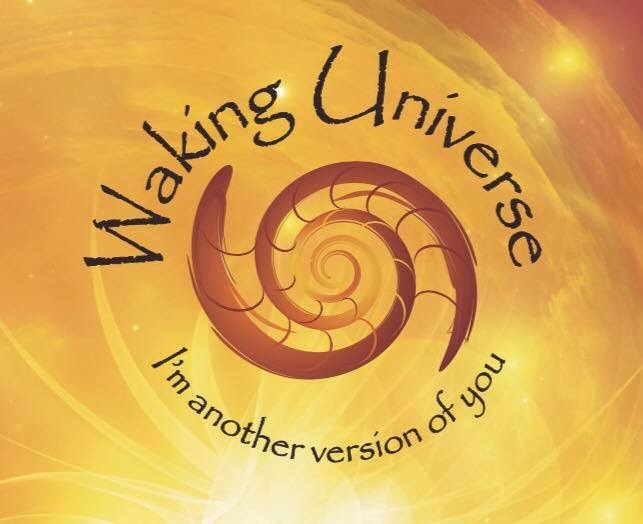 Waking Universe is a place for you to detail your journey also, the best of your ideas and books and research of every faith, science, creed and culture you’d care to bring so please pull up a chair and speak up. The Library of Alexandria used to be a place like that. It was once the greatest library in the ancient world, the eighth wonder, a repository of all knowledge from the four winds deemed worth keeping. They say it burnt down. I beg to differ. Knowledge that can empower you is everywhere, all truths are universal and impossible to destroy even when you don’t personally subscribe. Regardless of who you are, where you’re from, what you believe, I want this site to be our Alexandria again as long as we can believe together in something bigger than ourselves. I postulate that God has a sense of humor and so do you. If I’m wrong, then Waking Universe isn’t for you. All that weird stuff that you don’t understand and don’t know if you want to know, well you gotta admit that it’s sometimes funny. Did you really look at the picture of the crop circle at the head of this post? It’s an alien smoking a pipe. Genius, whether it’s Mr. Spock or drunk college kids on a romp, damn fine funny and inspired stuff. At the end of the day? Take everything on this site with a grain of Himalayan sea salt. I’m not a lawyer. I’m not a doctor and I make no medical claims whatsoever. I’m not a priest either, (although i did once on a lark send ten bucks off for a certificate that says I’m a reverend, so I can officially marry you at sea). I don’t claim to be an expert in much and I will no doubt get some details wrong from time to time. However, I do take the process of sharing things that inspire me and may inspire creative thought via engaging, profound dialogue very seriously. Mostly I just gather the thoughts and hit go. Some of it is research for my film work. Maybe together we can make a movie that inspires us and hopefully another version of us too. Maybe we can call it… life. I hope you decide to hang around now and again to co-create some reality with me. Afterall, it is your world. We just live in it.